Samsung Galaxy Note 10.1 impressions: Third time’s a charm? With the Apple vs Samsung patent trial going full bore, some analysts have been somewhat harsh on Samsung, including myself. But we also haven’t been giving it enough credit lately for going out of its way to try out new software ideas. With the Galaxy Note, it pushed the boundaries of phone sizes and made the stylus a useful item again (kind of). With the Galaxy Note 10.1, Samsung hasn’t reinvented the tablet, but it has introduced many useful ideas to Android tablet ecosystem, which should help it compete against Windows 8 this fall. 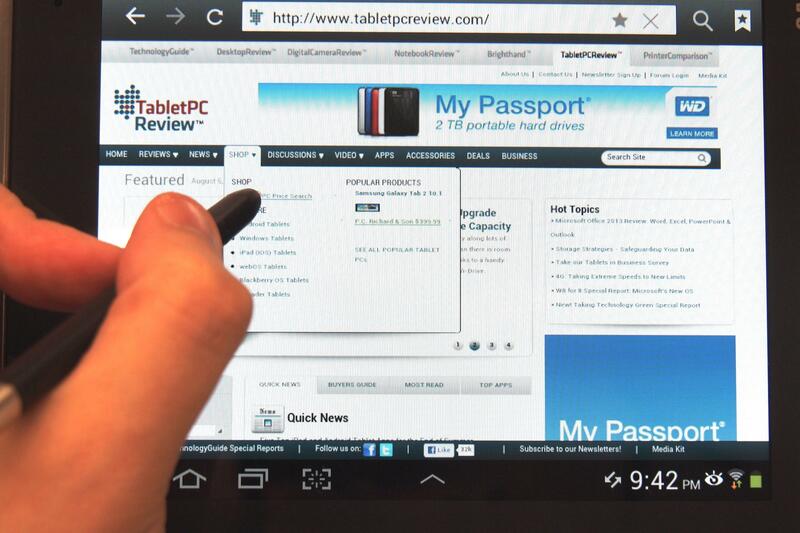 Check out our full Samsung Galaxy Note 10.1 tablet review. 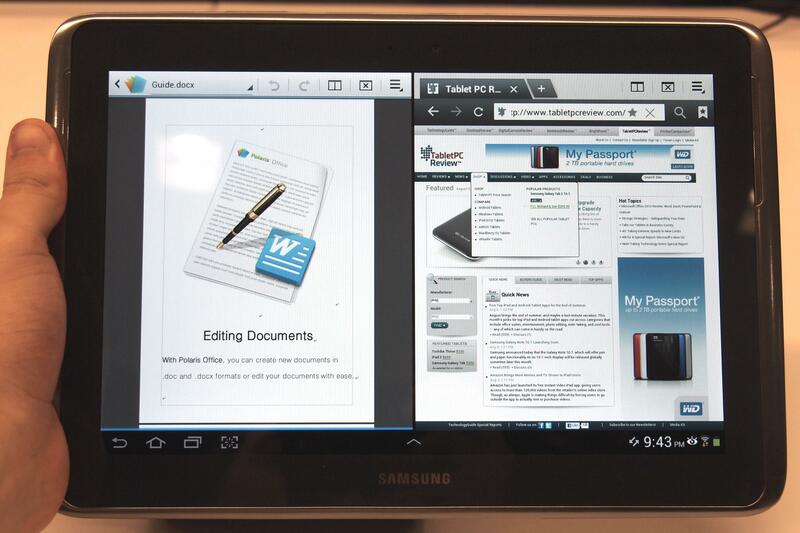 The most exciting new idea in the Note 10.1 is its splitscreen multitasking. Though Android doesn’t officially support splitscreen app use, Samsung has modified Google’s operating system to fit its needs. You can now open up two apps at once and run them side by side. This opens up a lot of possibilities, like more easily copying text from one screen and entering it into another. The screen splits right down the middle, which makes for a better experience (in some cases) than the way Windows 8 handles multitasking. There is a downside. This new feature is only usable with six built-in apps. These are the Web browser (not Chrome), the email app (not Gmail), the Gallery, the Video Player, S Note, and Polaris Office, which is an Android document editor. Having both Polaris office and the Samsung browser is nice, but this new ‘Multiscreen’ feature would need to become a standard baked into Android for it to be usable across multiple apps. It’s a good idea, but its uses are limited. Even the new Adobe Photoshop Touch app that was built together with Samsung isn’t able to be used in splitscreen. Samsung’s mini app tray is still included as well, which similarly lets you open up small floating windowed versions of a half-dozen Samsung apps like the calculator and calendar. And if you’ve loaded videos and play them through Samsung’s Video Player, you can make the video pop out and move it around the screen while you do other things. All of these features might be useful and show off the power of the new tablet, but they are all quite limited. There are hundreds of thousands of apps on the Google Play store to download and none of them will support these features. An S-Pen stylus is integrated into the Note 10.1 and can be pulled out whenever you want to use it. Executives pointed out to me that the new S-Pen is square so that it won’t roll off a table and designed for comfort. Like the original Galaxy Note, the Note 10.1 uses a Wacom touchscreen, which is, I’m told, the same type of touch technology that architects use due to its precision and responsiveness. The new Note tablet is also four times more pressure sensitive than the Note phone, which has enabled a cool new feature: hovering. If you are using the S-Pen and hover it close to the screen, you’ll see a tiny dot appear, which is a little smaller than a mouse pointer, but acts the same way. This is one of the coolest new features of the device and will work on any application. It’s most useful, however, on the Web. There are a ton of websites with menus that pop up when you hover your mouse over them, but these websites were mostly unusable on touch tablets because you can’t really hover your finger. This new hovering feature on the Galaxy Note 10.1 lets you better navigate the web and worked with great precision when I tried it out (see the video below). The Note will also come with a built-in Nook reading app and upgraded S Note app, which had some cool integration with Wolfram Alpha, allowing you to write a math equation and have it solved for you (unfortunately for students, I don’t think Wolfram Alpha shows each step). Samsung also has an app called S Suggest that will showcase other apps in the Google Play store that take advantage of the S-Pen. Samsung has done its best to make the S-Pen a handy tool. On the Note 10.1, I can imagine pulling it out and using it, which is a first. The general design of the Note 10.1 hasn’t changed much, and yeah, it still has a glossy finish that is a magnet for fingerprints, but on the inside, Samsung has upped its game. The new Note will be the first device to feature Samsung’s new 1.4GHz quad-core Exnyos processor and will come with 2GB of RAM, 16-32GB of internal flash storage, and supports microSD cards up to 64GB. I wasn’t able to perform any benchmarking tests, but judging from the sheer number of applications I had open without the tablet slowing down, I’d say it could be one of the most powerful units on the market this year. The extra RAM is especially important. NFC is not included in this tablet, but other features like Bluetooth and GPS are embedded. It is currently Wi-Fi only. Like the Galaxy S3, the new Galaxy Note 10.1 is so full of new features that it’s difficult to discuss them all. It has many S3 features like SmartStay, which keeps the screen on when you’re reading, and Groupcast, which lets you run a meeting where everyone in the room can participate in a slide show, assuming they have a Galaxy Note. There are a lot of little features like this, many of which you’ll never use, but Samsung is betting that no one will get mad at it for including too much free software. It’s a good bet. Still, even with all these new features, Samsung is going to have a tough time competing with the iPad, which is also priced at $500. The iPad has a nicer screen and an app selection that dwarfs Android’s tablet apps, which still seem to number in the hundreds. But there are now six apps that can multitask on the Note 10.1. On the iPad, there are none. The new Samsung Galaxy Note 10.1 tablet will be available starting tomorrow, August 16, 2012 and will cost $500 for the 16GB version and $550 for the 32GB version. It will be available on Amazon.com, Best Buy, Tiger Direct, Office Depot, and Hhgregg.